I use OnXMaps for Garmin to scout areas that I have been hunting successfully for many years. 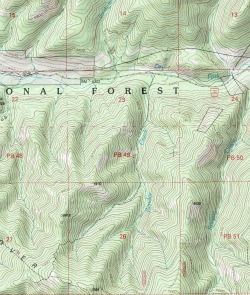 The maps help me remember the elk activity I have experienced in my areas. Since I hunt the same areas every year, I don't even scout on the ground. I just study my notes from previous years on OnX Maps. The elk patterns vary, but as elk move in and out of the areas, they return every few days to the same general patterns. I know many of you won't even see your hunting areas until you are there at camp. OnX Maps smartphone and GPS map apps and software can really shorten your learning curve in the area you plan to hunt. Their data for public land is thorough and helpful for finding access to hunting areas. The software is also accurate and up to date for private land ownership, as well. You can find the name of the land owners, in case you need to ask for access. Or, simply want to know where those private land boundaries are. You'll always be able to know where boundaries are and where you are in relation. OnX Maps has thoroughly researched back roads, so the data about decommissioned roads is accurate. Those closed logging roads are important resources to hunters. Trails are also a focus for OnX Maps. They pull their data widely from many resources for a very thorough mapping system. You might want to start at their OnXMaps Scouting Secrets pages. Other options for hunter map resources are discussed on our Hunting Maps page. You'll even find a link for printing free maps there. Spend some time with hunting maps and save yourself some time learning your area, or use them to document what you've experienced. You can also get enough information from these maps about hunting areas to ask intelligent questions of local wildlife biologists. You'll get better answers if you ask better questions. If you can discuss drainages and peaks, rather than just asking, "where's the best place to hunt", you'll get more complete advice. We've been busy remodeling, stocking and opening our archery pro shop, Elk Tips Outdoor Gear in Deer Lodge, MT, so we haven't written much. But, you'll hear from us again soon. We're busy putting a thorough line up of products in our online store to be made public soon!